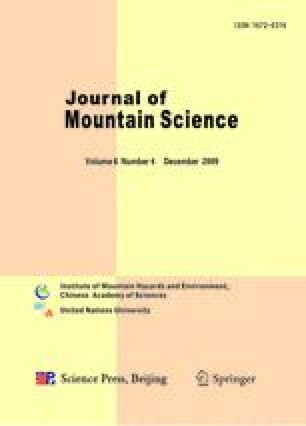 This article investigates the soil properties in two soil profiles from the terraces of the Nam Co Lake in Tibet, China. Profile 1, with a slope aspect to east, is 37 m, and profile 2, to southwest, is 32 m above the lake level. Twelve and nine layers were identified in profile 1 and profile 2, respectively, based on the color, texture, structure, moisture content, presence of carbonate, and root density. Grain sizes and measurements of water content, total organic carbon, total inorganic carbon, total carbon, pH value and electrical conductivity were all analyzed for each sample. The results show that soil is poorly developed because of sparse vegetation coverage and weak chemical weathering in the cold and arid area. The results also indicate that the soil properties are different between the two profiles and suggest that soil is better developed in profile 1 than in profile 2. These differences are ascribed to the dissimilarity of landform, vegetation and timing. Profile 1 faces to east as compared with profile 2 facing to southwest and gets less insolation and therefore less evaporation. Thus, vegetation grows better in profile 1 than in profile 2. Radiocarbon dating and OSL dating show that profile 1 underwent a longer soil forming process than profile 2, which is helpful for the soil development in profile 1.